In honor of the 80th anniversary of the animated classic Snow White and the Seven Dwarfs, Disney is releasing a new ‘Dream Big, Princess’ handbag collection from Dooney & Bourke. The collection will be released September 30 at Uptown Jewelers on Main Street U.S.A. in the Magic Kingdom. 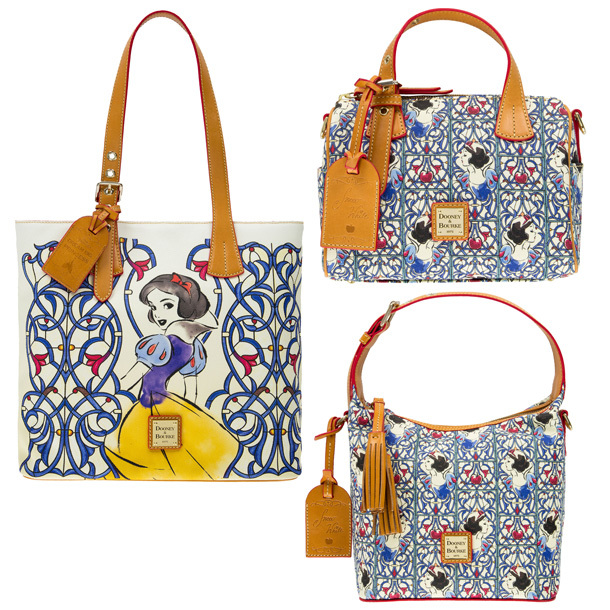 The new handbags feature Snow White’s signature colors – red, blue, and yellow – along with a stained glass window design. The new collection includes a Tote with a design that will be the same on every bag, and Satchel and Crossbody bags that will feature a repeating pattern (so not all bags will look the same). Each handbag will also include a special hangtag with Snow White’s signature. In addition to Uptown Jewelers, the bags will also be available at select locations in Disney World, Disneyland, ShopDisney.com, and the Shop Disney Parks app.